It must be nice to live within the kingdom of the Canvasback. I have, at times, lived where I could go visit some. There were a few ponds on Long Island where I could reliably find a couple of hundred Cans. When I was first married – in the early 70s – I could see over a thousand on Lake Champlain. When I lived in Buffalo we had flocks circling our rig on the Niagara River. The season was closed but it was a sight to see – these really big divers cutting their figure-eights above our heads – with those long silvery wings. 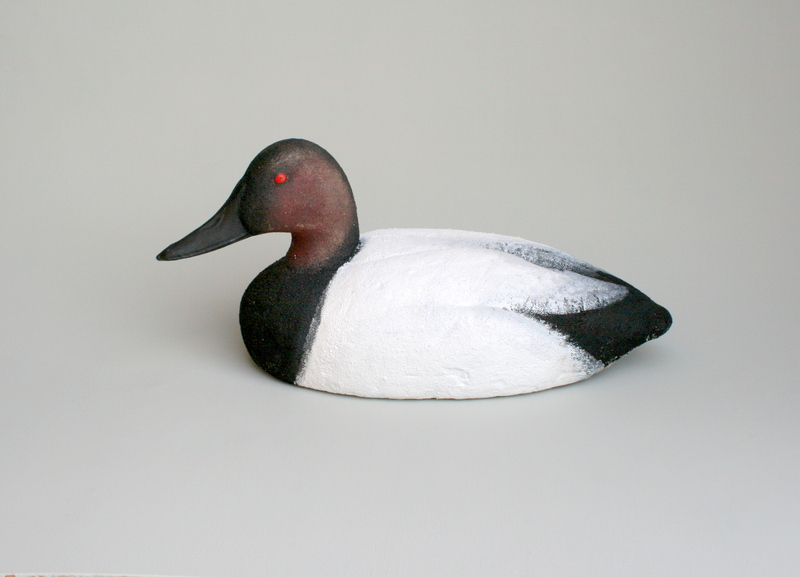 They are a great bird to carve and to note the minor differences between them and their other pochard cousins – not much of a tail section and that neck can get mighty tall. I especially savor the Roman nose bump and the stippled canvas on the back. This pair are Herters Model 72s – the overize styrofoam birds from the late-50s. We have always had a half-dozen in our Broadbill rig. All 6 have been refurbished with epoxy + sawdust and new paint. 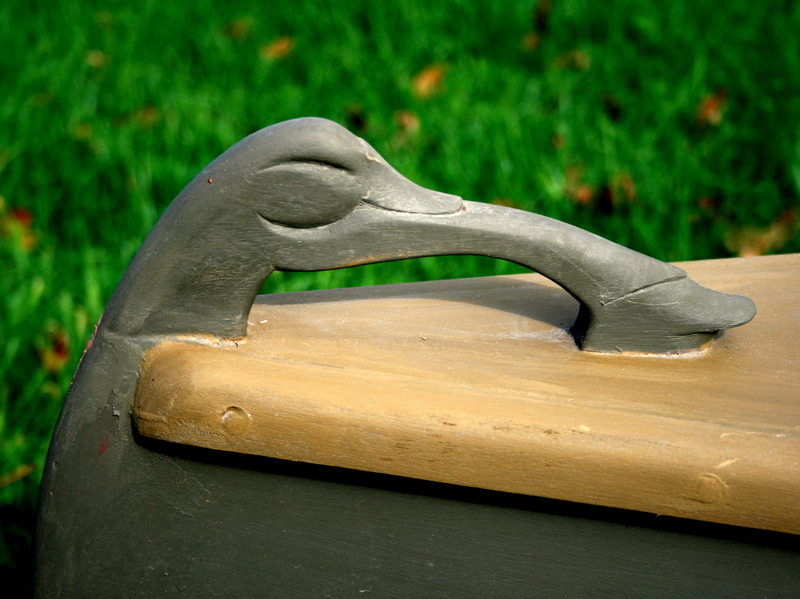 and , of course, a bow handle – on a 16-foot canoe I’ve named Canvasback. These magnificent birds also impress on-the-wing. I miss this half-size flyer. It used to greet visitors in our mud room – but has since migrated south of the Mason-Dixon. This old bird is a newcomer. 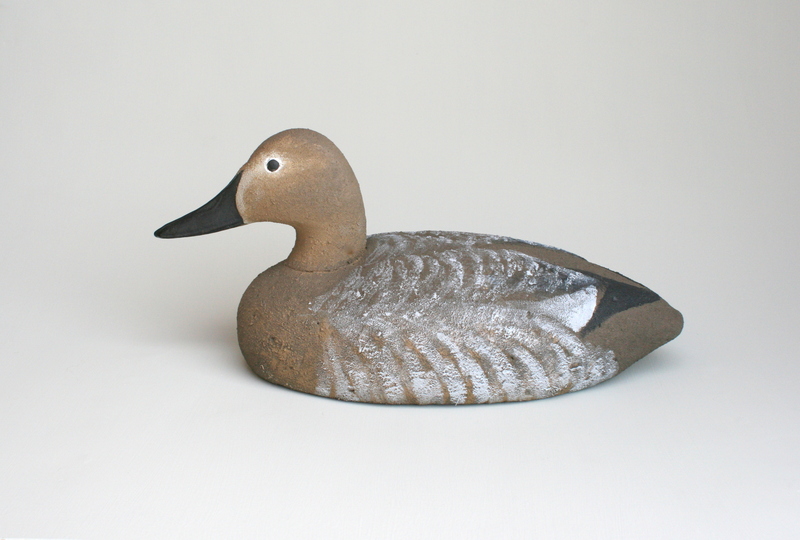 I have recently been hunting for older Wildfowler decoys – especially the balsa-bodied Superior Model – in Broadbill (for my shelves) and Mallard/Black Duck (for yet another puddle duck rig for smaller waters). 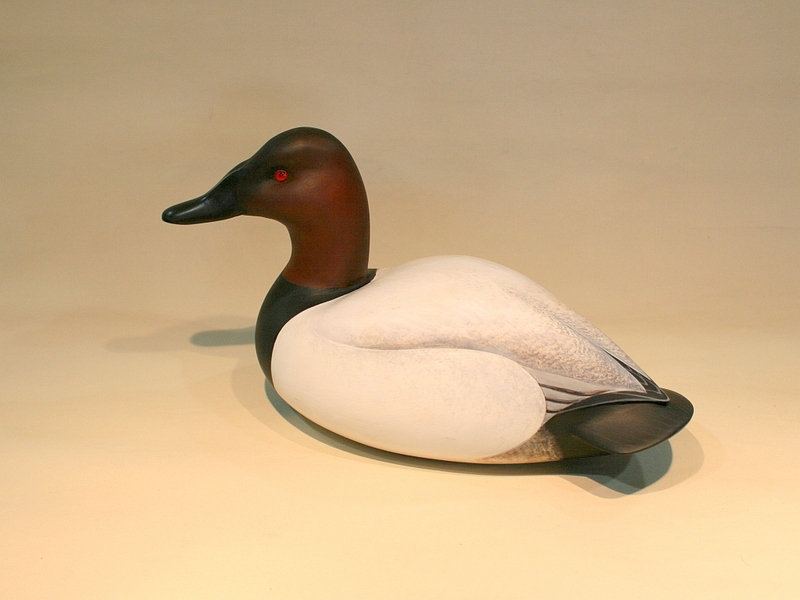 This bird was a gift that met my criteria: an Old Saybrook (CT) or Quogue (LI) gunning decoy that has seen plenty of wear – and so held little collectible value in its hard-earned state. This bird had a loose head, a missing eye and had been re-painted (the Black fore and aft) sometime during its career. Best of all, it had an appealing shape and a nice Quogue brand. So, I set about “restoring” it – in my own way. I have not been returning these Wildfowlers to their original paint. Instead, I imagine myself back in the day – in the employ of Ted Mulliken (Wildfowler founder in Old Saybrook) or of Rab Staniford (Quogue owner). I apply a “Steve Sanford paint-job” on these birds as if they were to be sold to the gunning public – or as if I had purchased them new in unfinished form. Here are some Mallards I have put back into fighting trim. Here’s a nice burly Broadbill – actually a Point Pleasant (NJ) bird. After a thorough but very careful sanding of the entire bird, I re-glued the head. I then installed two new eyes. The remaining original eye was amber – and not the bright red of an adult drake. So, I replaced both with new pin-point pupil eyes with scarlet irises. I then sealed the entire bird with spar varnish. Balsa is very soft and soaks up the varnish thirstily. It toughens the wood, especially the tip of the tail and along the “chines” – where the sides meet the flat bottom. I took special care to preserve and ptrotect the Quogue brand. Next I marked up the major areas of color. 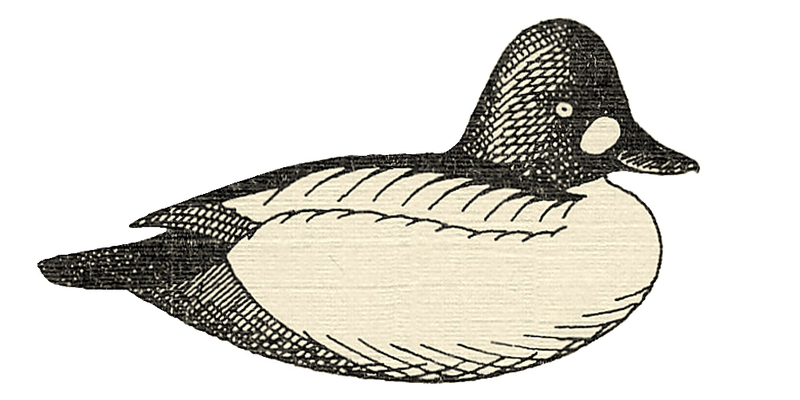 All of the Pochards – Canvasback, Redhead, Scaups, Ringneck – appear dark-light-dark on the water. However, the body proportions do vary. The Can is best adapted to diving. He has those big paddle feet set way back on his body and so the dark tail section is relatively smaller than in his cousins. His dark chest is smaller, too. And, the dark of his bill extends back onto his face and up to his crown. He was first primed with flat oil paints, then top-coated with latex house paints – my usual Behr sample jars from Home Depot. Whereas Wildfowlers used air brushes/spray guns on their paint jobs, I am strictly a (bristle) brush guy. So, I stippled the back and sides with 3 different tones of white and grey to get than heavy canvas look. Here he is – a fine Bull Can ready for the shelf or the Bay. 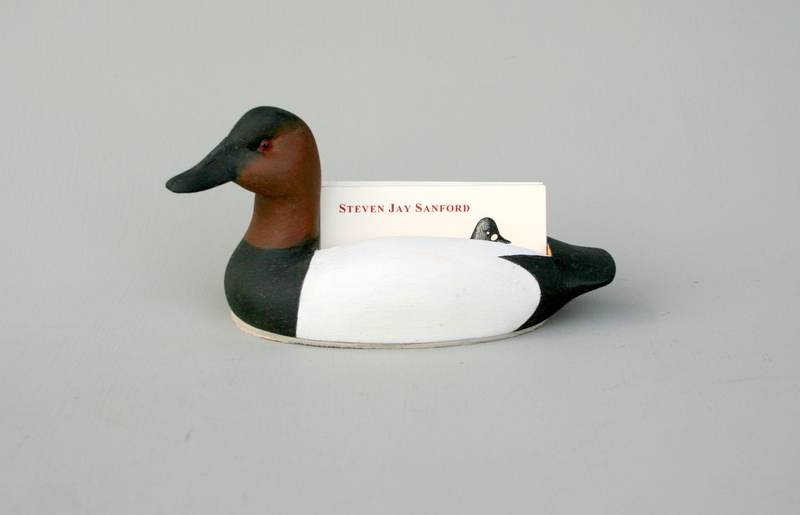 The Canvasback is my favorite duck/decoy. I have a small collection of canvsasback decoys, and I am very particular about the Cans that I collect. 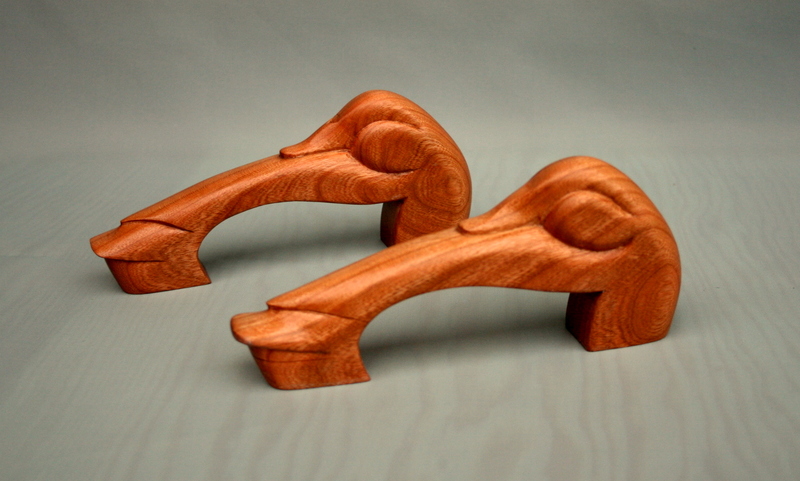 The first birds in my collection were a pair of highhead Cans by Ken Harris. I am very happy to say that the beautiful drake Can pictured at the top of this piece also resides in my collection. Thanks Steve for the true beauty that you create. Bill Tribou, Schroon Lake, NY.